The above words are the English character rendering of the Tsolyani language title of the Book of the Mighty Imperial Deeds of the Great and Glorious Petal Throne, the royal decrees of the Emperor of the Petal Throne which are published upon leaves of gold and kept in the mysterious Hall of Blue Illumination at the chancery in the Royal city of Avanthe. I don't have a Tsolyani font generator unfortunately, or I could show you the beautiful, fluid exotic calligraphy of the title in Tsolyani script in all of its lush, vibrant movement on the page. Now unless you were born upon the planet of Tekumel to one of the nobility clans of mighty Tsolyanu and are of sufficient rank, you are not even permitted to enter the Blue Hall, let alone touch or read the Book of Mighty Imperial Deeds. 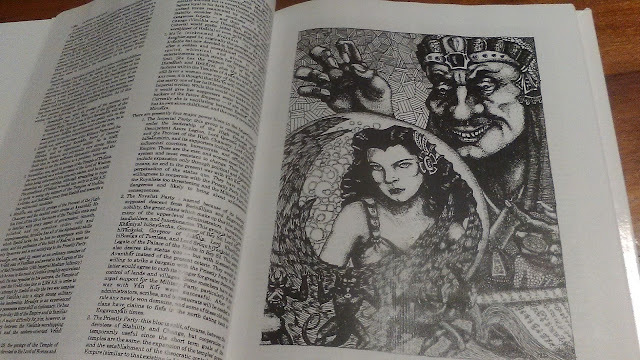 However, you can acquire and read the Tekumel Source Book from the Tekumel Foundation through DriveThru RPG and obtain an in-depth survey of the origins, races, geography, cultures and mythologies and religion of Tekumel, brought to you by the hand of the late Professor M.A.R. Barker, creator of the fascinating world of the Petal Throne. In it, you will find all the setting information you need to run a plausible Tekumel campaign. The book contains no maps or playing rules--it is strictly setting material--but these are easily enough obtained through online order. In fact, there are playing rules available for free download at www.tekumel.com and artist Jeff Dee, of TSR fame, has also recently published a set of rules called Bethorm if you are interested in the latest Tekumel rules. There also exist online conversion guidelines for playing Tekumel with AD&D, Savage Worlds, GURPS, and even Runequest. I am extremely happy with my new copy of the Sourcebook, which is available in watermarked PDF or black and white hardcover. The book arrived very promptly and appears solidly bound, the ink so fresh and crisp that it actually still shines. It ran me around $30.00 after shipping. It is not heavy on illustrations but what art it contains consists of very elegantly inked renderings of the various Tekumelani non-humans by a capable artist named Craig Smith, two historical scenes from Tekumel by Professor Barker, and a couple pages of the diverse Tekumelani scripts. 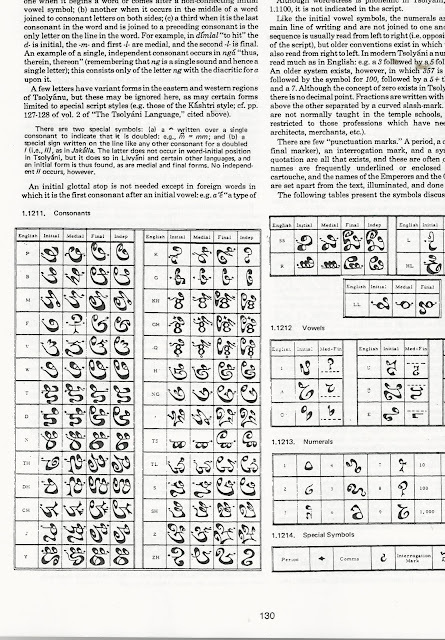 On of the more interesting features of The Sourcebook--a number of pages dealing with pronunciation and writing of Tsolyani and other Tekumelani languages. These will allow a game master to create some very interesting props and gradually, word by word, introduce enough actual Tsolyani words to really add flavor to a game. M.A.R. Barker invented these languages, and he had the credentials to do so: he was a professor of Urdu and South Asian languages and the Chair of the Department of Asian Studies at the University of Minnesota. He authored a book on the Urdu language and had articles published on the language of the Klammath Indian Tribes of Oregon as well. He also traveled to many countries on anthropological and linguistic studies and also because he loved to see these places. The Professor had very interesting perspectives to bring to the world of gaming and fantasy world building. An illustration by M.A.R. Barker depicting the Wizard Ny'elmu gazing upon Princess Ma'in in his Globe of Distant Discernment. The faded appearance is actually light glare from the super fresh ink! If you are unfamiliar with the world of Tekumel, it has a long and storied history in the annals of gaming. It was the one of the first Dungeons and Dragons games, published in 1975 by TSR as the boxed set Empire of the Petal Throne (EPT). Prior to it's debut as a role playing game it had existed for many years as an intricately detailed fictional setting created by the Professor as a basis for a series of fantasy novels he later wrote which have seen major publication. 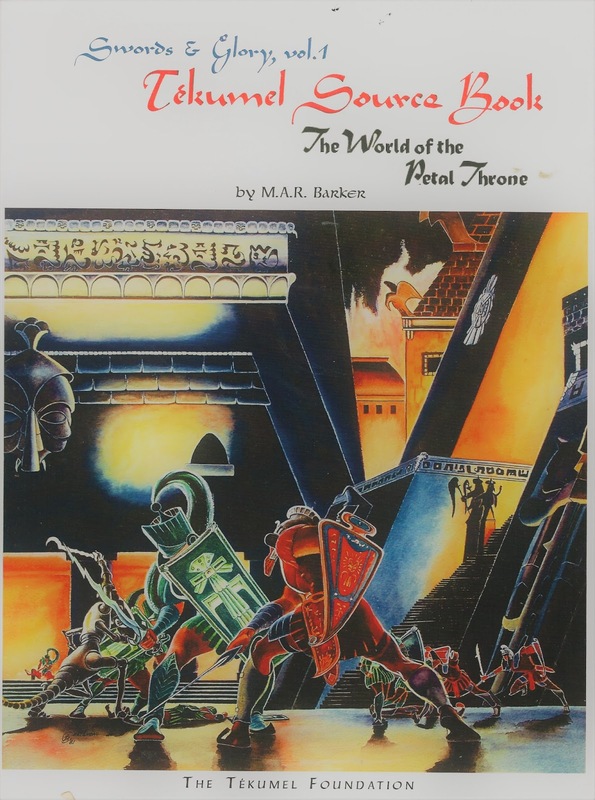 Tekumel has been the subject of a score of professionally produced game materials published at various intervals from that time until now, including lines of metal miniatures, boardgames, roleplaying games, and wargames. A very rich body of fan and player produced material in zine form also exists, as well as an extensive internet archive of articles, correspondences with M.A.R. Barker. 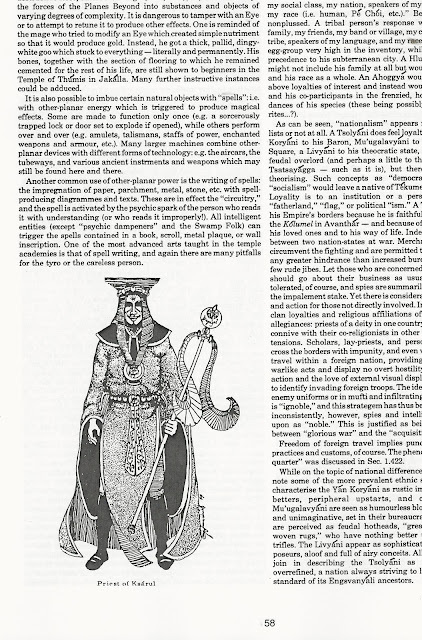 In short, there is no want of resources for an enterprising Gamemaster who wishes to convey his players to the strange and wonderful world of Tekumel. 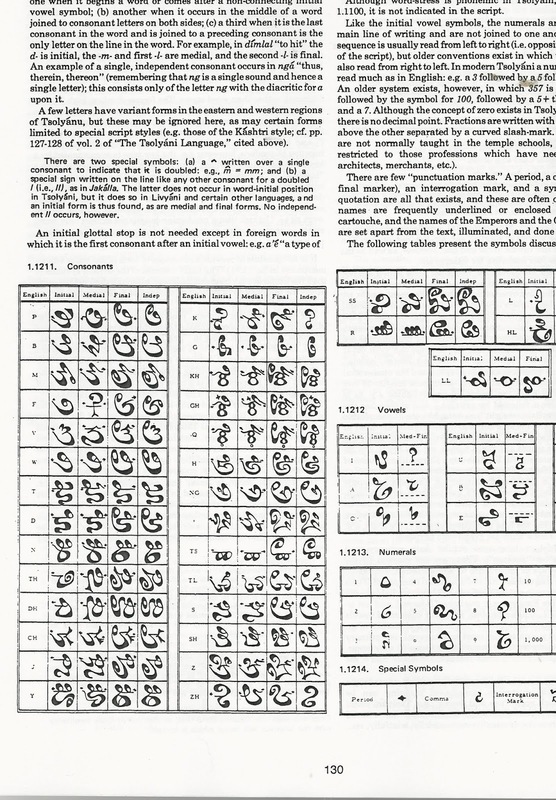 The Tekumel Source Book is my personal favorite resource. Weighing in at 150 or so pages and containing a very extensive index, nearly every detail of Tekumel history or society is at the GM's fingertips, and it is not a dry read. Aside from the T.S.B. being artfully written, you can feel Professor Barker's enthusiasm and energy coming through every line. 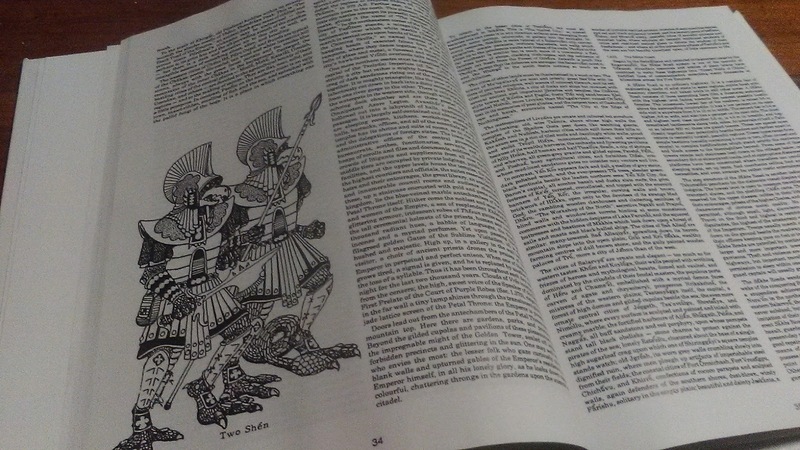 The book is broken into numbered sections and subsections and contains a very detailed historical overview. Tekumel actually has a science fiction basis, having been an alien planet settled by starfaring Earthmen as well as other galactic races. A great cataclysm buried Tekumel's technological pasted and frayed the inter-dimensional boundaries, allowing the influence of powerful entities who were destined to become the "gods" of Tekumel. Their energies also became a means of power to the peoples of Tekumel--energies that on the basis of intent, purpose and effect constitute what any rational person would call magic. Tekumel is one of few games to offer a scientific rationale for it's Deities and spellcasting! After the cataclysm, the races of Tekumel found themselves sundered from the galaxy they had known, trapped in a dimension all their own. Soon, the technological marvels of the Ancients had become only legends and relics, the superiority and relevance of technology being eclipsed by the practical uses of the new magic. From the ashheap arose new civilizations and empires, the first notable one being the ancient and mysterious Ilyan, a culture largely only known from buried inscriptions. Then came the Three States of the Triangle, a civilization whose foundations were laid upon three great cities of antiquity and their trade routes. This civilization was swept away by unnaturally tall and fiercely warlike barbarians called the N'luss, riders of Dragons, history being unclear as to whether these Dragons were strange beasts now unknown to Tekumel or technological relics of the star-faring ancients. The reign of the Dragon Warriors would in turn give way to the Fishermen Kings, powers so named because of their great sailing ships. The end of the time of the Fishermen kings was occasioned by a 13 year old slave girl who was to eventually become concubine to a king, then a queen, and ultimately, by various intrigues and well planned marriages and assassinations, one of the most powerful royal personages of all time. From the kingdom of Queen Nyari would arise the First Imperium which flowered into a Golden Age that saw incredible religious and cultural innovations. The Golden Age was to be followed by another terrible decline, the Time of No Kings, brought about by physical cataclysms and terrible wars, but this has been followed by the glorious Second Imperium. All of this is but a taste of the history you find in the T.S.B. along with the names of the names of each Seal Emperor of the Petal Throne, the duration and hallmarks of their reigns, and the contemporary political climate in Tsolyanu (home nation of the player characters) and it's four neighboring kingdoms. At the commencement of a game campaign set on Tekumel, the players will begin in the year 2,358 of the Second Imperium. There is an abundance of resources given to a GM who might wish to run his or her Tekumel game based on politics and intrigues as much as monster killing and treasure winning. You will find no Tolkien here--Tekumel as a setting is an amalgamation of science fiction pulp magazines and swashbuckling films concealed neatly in a lavishly painted milieu that evokes Mesoamerican, East Indian, and Dravidian mythological patterns. A pantheon of Gods which consist of Five Gods of Stability and their polarities, the Five Gods of Change, provides the rich and elaborate Temple life of the cities of Tsolyanu. Each God or Goddess also has a Demigod servant and attendant known as a Cohort, each of whom are honored in their own name along with that of their master or mistress. Religion plays a major role in every player character's life in a game of Tekumel, and magic using characters normally acquire their spells from the Temple teachers. The nonhuman races of Tekumel are as richly detailed as Tsolyani culture. There eight non human races available to a player, one of my favorites being the hulking Shen, reptilian "Demon Warriors" from arid wastes who are among the most feared warriors on Tekumel and hence highly sought after as mercenaries. Tsolyani culture will be something quite different to players used to the quasi-medieval setting of D&D. It is not politically correct by modern standards, to put it mildly. Slavery is a punishment for crimes as well as an aftermath of losing in battle and well established as a caste. The Stability Gods generally do not favor humans as sacrifice but they sometimes do and one of them, the war god Karakan, is served by a priesthood who routinely offers him the captured warriors of foreign campaigns. The Change Gods delight in human sacrifice, some more than others, and it is routine in their Temples and an accepted facet of Tsolyani society. A player character's highest loyalty is most always to his or her clan and it's interests and reputation--if a player is role playing properly in a Tekumel game, the interests and reputation of the clan are even more important than the private and individual concerns of the character. Also, Tsolyani society is patriarchal, albeit, not empirically so; a woman may declare herself "Aridani" at any time in her life she wishes, and as Aridani she enjoys complete equality both socially and legally. Polygamy being a male prerogative in Tsolyanu, Aridani women may also follow that path as well. Aridani women can rise as high in the Temples or Imperial government as any man--acceptance of the custom is universal. Homosexuality and multiple partner relationships don't raise an eyebrow on Tekumel. The class system, closely related to the status of a clan, is accepted without question and people who speak or act disrespectfully to those of higher status may find themselves in serious trouble. Honestly, if you have a player in Tekumel who insists on trying to relate to Tsolyani culture in terms of traditional D&D, that player's character will probably not live long. If they speak to the Imperial legionnaires as they are used to speaking to town guardsmen in other settings or try to pickpocket someone, they could simply be killed--impalement is the usual method. The Legionaries are the direct representatives of the Emperor, and stealing is considered base and dishonorable. Not that no one steals, but there is no acceptance of a thief class or guild. Tekumel is great fun but it requires being willing to really commit to being Tsolyani. Players who can do so will find themselves richly rewarded with the unique gems that gaming on Tekumel has to offer. Still, Professor Barker often offered this caveat in his writings: in the end, the Gamemaster is free to develop with his or her players any Tekumel that pleases their taste. He encouraged people to take what appealed to them and set aside the rest, so actually, a GM could run Tekumel much as they run other campaigns. Still, I feel that people who put a little effort into gaming on Tekumel in accord with M.A.R. Barker's vision of his setting will find it very much worth the adaptation. A great illustration of one of the Priests of Ksa'rul, the God of Change who prizes knowledge and occult wisdom for purely selfish means. Ksa'rul was such a threat to the other gods and goddesses that even his fellow gods of Change allied with the Stability Gods and aided his imprisonment in a state of eternal slumber in a strange dimension known as the Blue Room where he sleeps and dreams even to this day; his Priests and Priestesses, however, will assure you that he shall not sleep there forever..
Swords and glory await you! Deathlords make their towers tall. The only people who roam the Ruined Pines are known as the Ghost Swords... but they are few, and they are seen seldom. The Prison Blade is a fast paced and exciting fantasy novel about a young noblewoman who takes possession of a magical sword in her family's reliquary, a sword which is the prison of a disembodied demi-god who then seeks possession of her, body and soul. A spell by her sorcerer brother temporarily saves her from that fate, but she and the demi-god must now share her existence and he is bent upon breaking the spell and assuming complete control that he may re-enter the material world once again. Orielle must find a way to break this unholy union which has earned her the title of the Mad Lady of Verendii because no one but her is able to see the ancient spirit with whom she must contend daily. But ancient evil powers are arising in her kingdom, and even as a band of stalwart heroes gathers around her, Orielle faces a startling revelation; could it be that Everie, the lord within the Prison Blade, is the only one with the power to defeat the gathering Shadow? Find out! Click the book icon above to order your Kindle Dowload or Print on Demand paperback novel of the Prison Blade! I am most happy to recommend that visitors to the Mazes try the exciting new Blueholme Prentice Rules published by Dreamscape Designs! I own three copies of the Prentice Rules and intend to use them to run a game for some young people; BPR is a great rule set for introducing new players to fantasy gaming or for old hands who want a system that lets you just play and not be constantly referring to a rulebook. The rules realy are that simple. 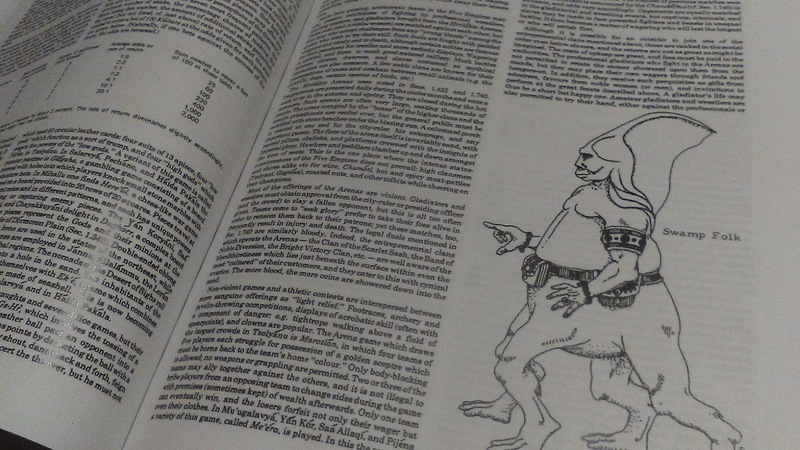 BPR is a tabletop fantasy roleplaying game crafted in the spirit and memory of the 1977 Basic Dungeons and Dragons Game by the late Dr. Eric Holmes. Blueholme captures the simplicity and unique pulp fantasy flavor of early D&D in a lovingly designed illustrated manual. Click the picture to visit Dreamscape Designs website and learn about all of the exciting and easy to learn Blueholme gaming resources. Blueholme was designed by Michael Thomas and is supported by the soon to be released Campaign adventure known as the Necropolis of Nuromen, featuring a dungeon originally designed by yours truly! Beer and Brigantine; Musings on Bruce Galloway's "Fantasy Wargaming"--click the image below! The Maze of Nuromen (1st-2nd Level Characters). Part 1 "Gate of Sorrows"
Part 2 "Descent into Darkness"
Want To Read Older Posts: Click on the Archive Arrows Below! I assume no responsibility for mental conditions which may be exacerbated by reading this blog. If you want to assemble your own gaming group, see my article about that in the April 2011 archives! J.E. Becker. Travel theme. Powered by Blogger.